A favorite woodlands plant that we have growing on our mountain ridge is called Smooth Solomon’s Seal, Polygonatum biflorum. It grows only in wooded areas and it blooms in the middle of Spring, followed by large blue berries in Autumn. Solomon’s Seal has one long arching stem that supports its linear and pointed leaves. Each leaf grasps the main stem at the base and graduates into a fine point at the end. Linear leaf veins that extend the length of the leaves show this plant to be of the monocot lineage. 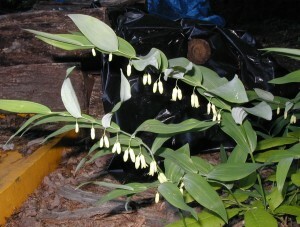 Smooth Solomon's Seal blooming in a Pennsylvanian forest. Photo taken 11 May 2012. Flowers of Solomon’s Seal usually dangle in pairs, but sometimes there is only one bloom at a leaf node or leaf axil. The cream-colored, bell-shaped flowers dangle from the main stem and sway with the breezes of Spring. 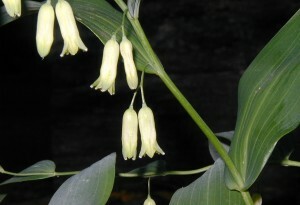 Flowers of Smooth Solomon's Seal dangle in pairs from leaf axils. Photo taken 11 May 2012. In the photo above note how the linear leaves sheath or grasp the main stem. If you’re not sure what species of Solomon’s Seal you’re looking at, check out previous posts on wildeherb.com for a little help on the different types of Solomon’s Seal, late spring blooming Solomon’s Seal, and the blue berries of Solomon’s Seal. A few weeks ago I came across a bookmark for a violet jelly recipe. Last year I marked the recipe page as the violets had already bloomed for the year when I first saw the recipe. I knew that Viola sp. were edible and had already put a few blossoms on top of a salad or on a plate or drink just to snaz things up a bit. The colorful blossoms don’t seem to have much of a taste and that made me curious about violet jelly. As serendipity would have it, a ton of native violets grow wild on our property. At the time I was reading about making jelly from violets our Northern Downy Violets were in full bloom, so we made a batch of violet jelly! Oddly, I thought it would taste like grapes, because of the cool colors I guess. The real taste is floral – like a violet and slightly fruity or berry-like with a faint hint of elderberry. 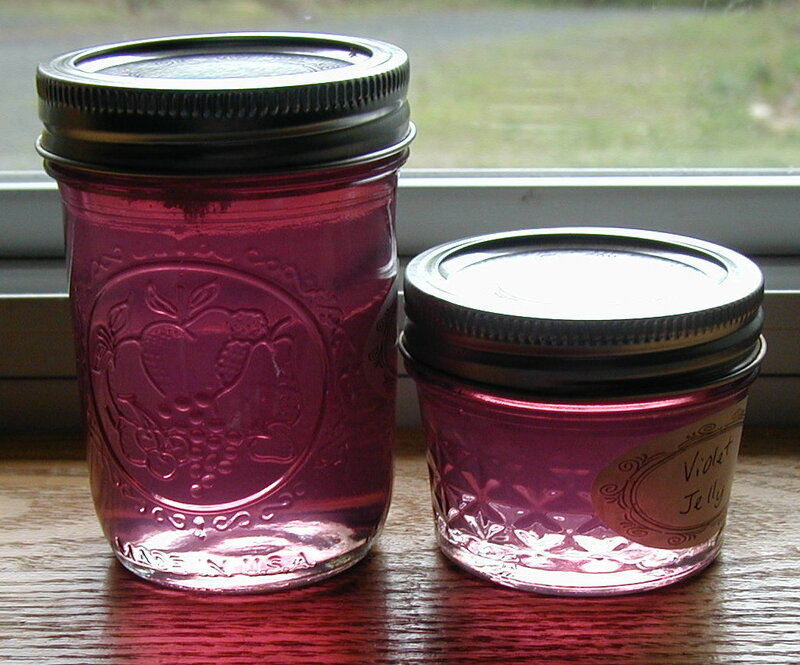 Elderberry jelly has a much, much stronger flavor, but there were notes of it in our violet jelly. Three of us went outside on a sunny and breezy day in April to pick two cups of violet flowers. Just the flower heads were needed so any stems that came off the plant were picked out of the bowl. Violet flowers were picked from our backyard on the mountain ridge top. Violet pickers happily picking flowers for jelly. Photo taken 20 April 2012. 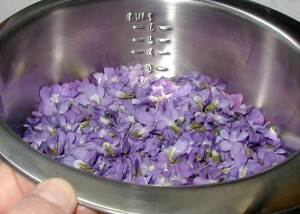 In about 15 minutes time we had the amount of violets we needed to make the jelly. Nearly three cups of violets were loosely tossed into a measuring bowl and the whole amount was firmly packed in a 2-cup glass measuring cup. Now, that’s not firmly packed like brown sugar measured out for a batch of cookies, but the flowers were pressed down lightly to fit in the measuring cup. Three cups of loosely packed violet flowers. 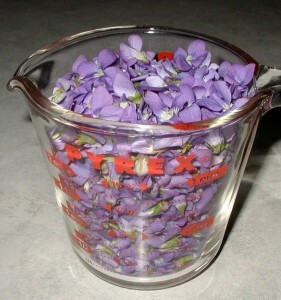 Two cups of violet flowers in a glass measuring cup. The violets appeared rather clean, but since the pollen has been very high lately they were given a quick rinse with water in a colander anyway. 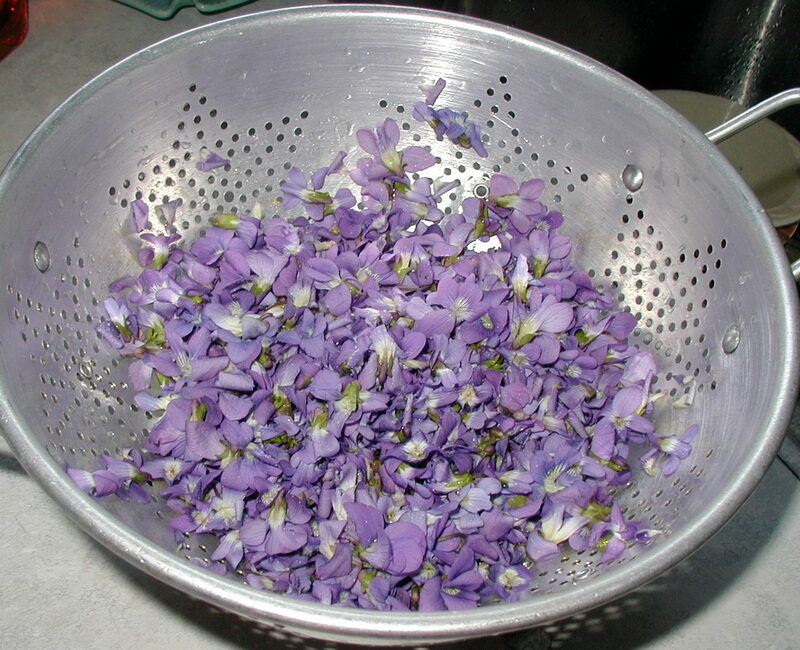 Violets were rinsed with water running through a colander. 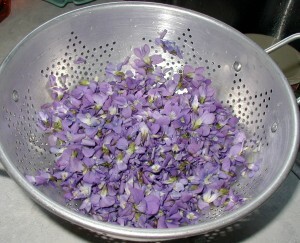 The next step for making the violet jelly was to pour two cups of boiling water on top of the flowers. We want two cups of liquid to make the jelly, so don’t rely on using the measuring cup scale for adding two cups of water. Since the violets already took up space in the measuring cup, boiling water was measured out in a separate measuring cup and then poured on top of the flowers. 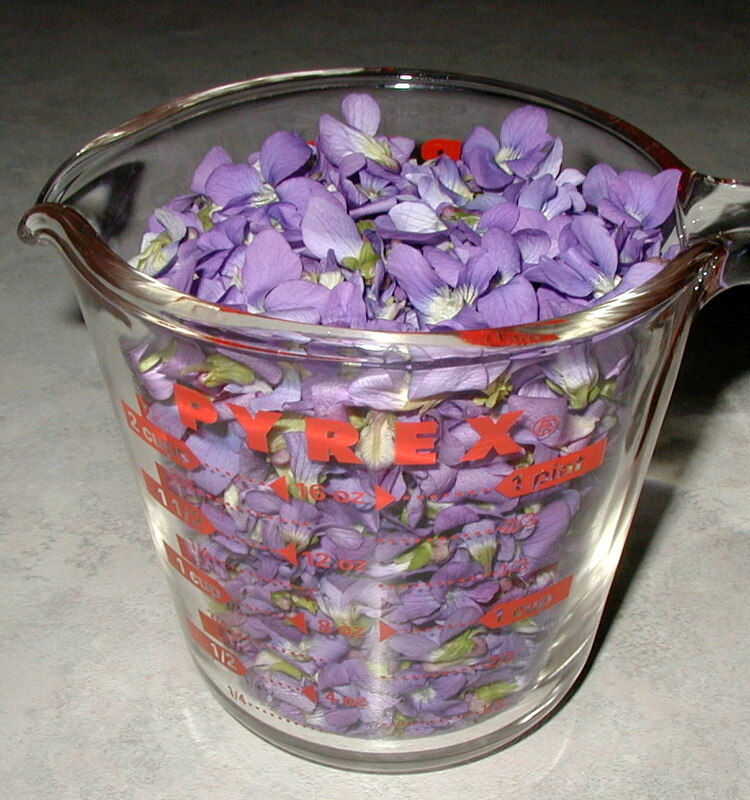 Two cups of violet flowers after two cups of boiling water was poured on them. 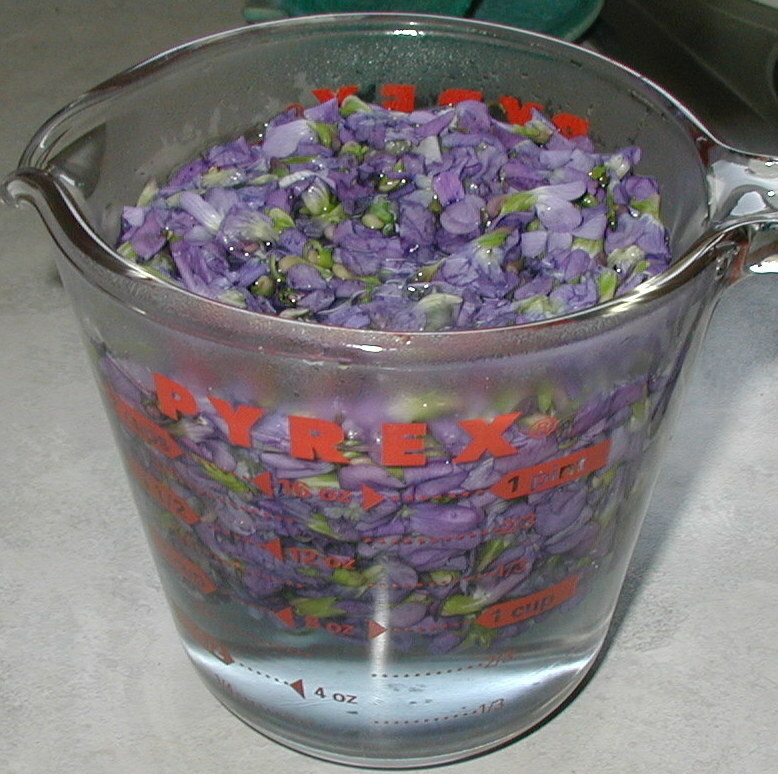 After a couple of hours steeping the deep blue liquid could be decanted off the flowers. We let the measuring cup sit at room temperature for a couple of hours so we could see the color develop and then let it sit in the refrigerator overnight. After 24 hours of total steeping time, a double layer of cheesecloth was draped over a 2 quart bowl and the flower and water mixture was poured over the cheesecloth. The flowers were held back from the liquid and then taken to the compost pile. 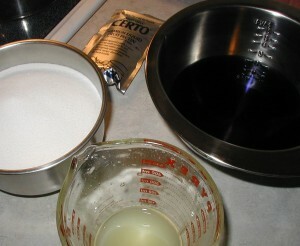 Ingredients for making violet jelly, including from the top, clockwise: 3 oz. packet liquid pectin Certo brand, 2 cups violet juice, 1/4 cup lemon juice, and 4 cups sugar. At this point the violet liquid was a very deep blue color. Four cups of sugar were measured out into a separate bowl. A 3 oz. package of liquid pectin, Certo brand, was opened and sat upright in a glass. A quarter cup of lemon juice was measured out too so that all ingredients were ready when needed. Previously, about an hour before, glass jars were washed and sterilized in the dishwasher and the door kept closed so that the jars would stay hot until needed. Bands and lids were sterilized with a kettle of boiling water poured over them as laid out in a skillet and covered with a lid until needed. Take caution! To cook up the jelly use a 4 quart pan. When we made this particular batch of jelly we used a 2 quart pan to cook the jelly and created one heck of a mess. As the jelly cooks to a boil foam is formed and that foam layer rises a couple of inches up from the liquid level in the pan. Needless to say there was a scorched mess on the stove top to clean up because the hot jelly ran over. I just knew that pan looked a little full at the time, but I neglected my own thoughts and decided to follow the recipe to a T. Wish I had listened to myself, but since I didn’t, maybe you won’t make the same mistake. At this point in making the jelly we should have transferred the blue liquid to a 4 quart pan before turning on the heat. The heat was set to high and the mixture was constantly stirred. The lemon juice was added and the color changed immediately from deep blue to a light lavender or pink color. 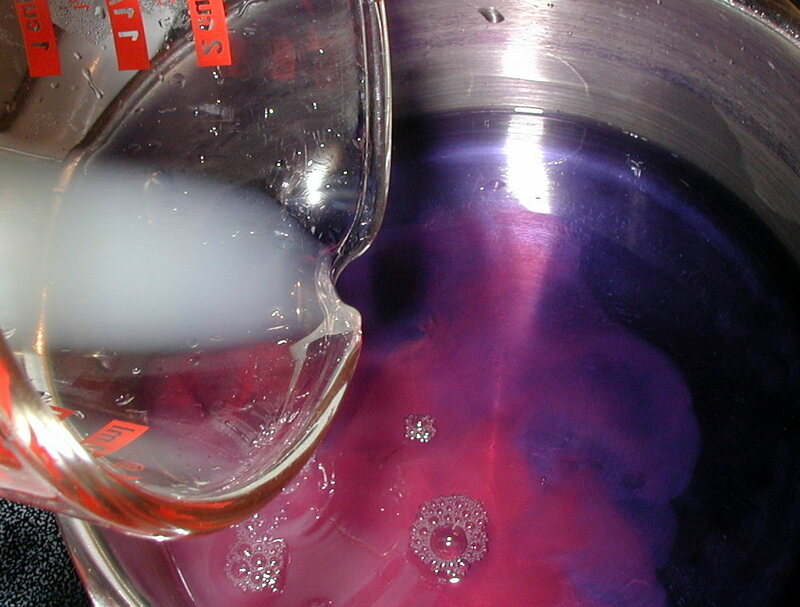 Lemon juice added to the violet juice turned the deep blue color to pink. Sugar was added to the pan and the heating continued. It didn’t take too long to bring the mixture to a boil and it was constantly stirred. 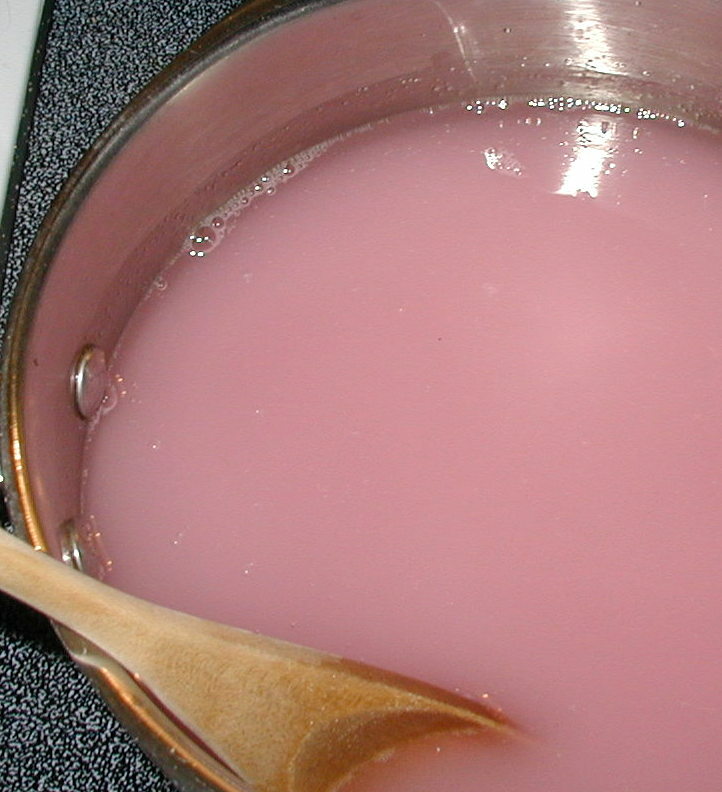 After sugar was added to the violet and lemon juices, the mixture was an opaque pink color that cleared upon boiling. Once the boil was reached, the packet of liquid pectin was added and the mixture boiled for two minutes more. With the smaller pan we had to guess at how long the pectin-sugar-juice mixture was actually boiled because the pan was taken off the heat to stop the boiling over. We guessed ok because the jelly gelled just fine. Jars of Violet Jelly made from Northern Downy Violets. 21 April 2012. Evidently, the same jelly recipe could be used for other floral jellies, like rose or rose hips jelly, or herb jellies, like mint or lemon thyme jelly. It would be fun to try some other fine jellies like that, but if we find another big violet patch, we’ll be making some more violet jelly first. While driving along a country road in the mountains the other day, I happened upon a few striking clumps of blue flags, also known as blue iris. I’ve previously posted about the alien yellow iris that we have growing wild in Central Pennsylvania. The deep colors of this blue iris certainly were eye-catching. These flowers were beautifully displayed at the side of a country road. Perhaps someone planted them there years ago. They appear to be a form of the Bearded Iris, Iris germanica, which isn’t native to North America. 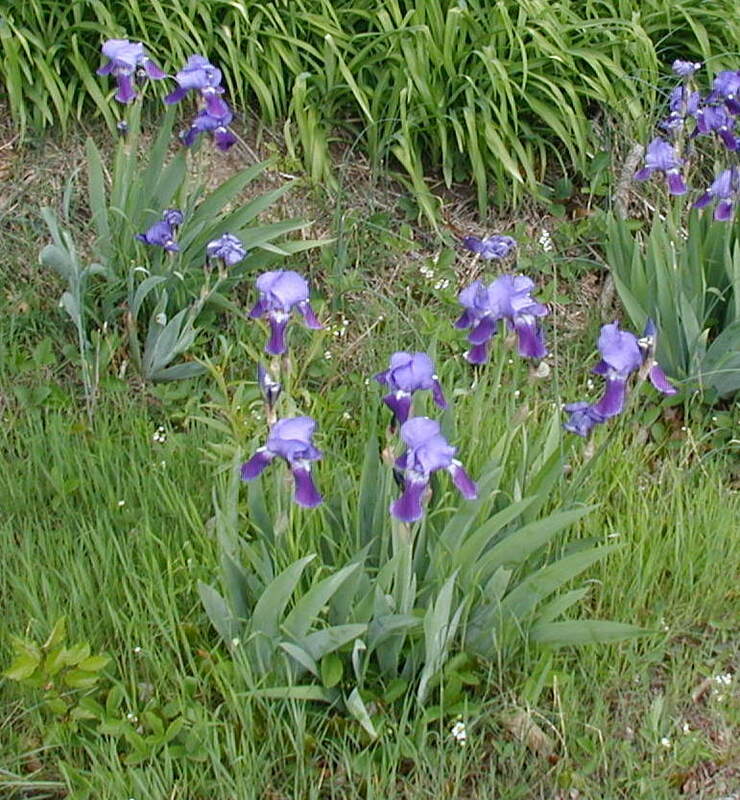 A different plant, called the Larger Blue Iris, Iris versicolor, is native to North America, and it can be found growing wild from Canada south to Ohio and Virginia. You’d be more likely to find this native iris in wet meadows, marshes and swampy places. Its upright petals and falling sepals are not as wide as the german bearded irises, which are represented in the photos below. 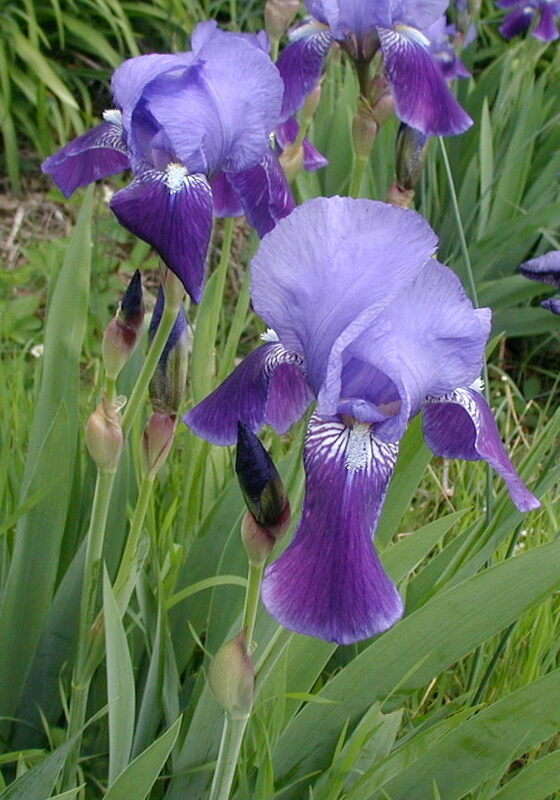 The Larger Blue Iris has large petals that are held vertically but do not fold over the top of the center of the flower like many of the colorful irises available at garden centers. It also has veins of yellow among its striking colors of blue and white. 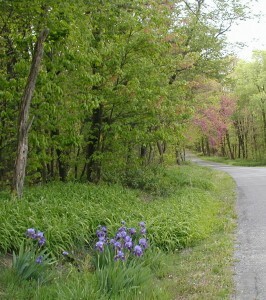 Bearded Blue Iris flowers beside a mountain road. Photo taken 28 April 2012. Just as with its cousin, the Yellow Iris, I. pseudacorus, the growth habit is in clumps. Several sword-like leaves arranged in a fan-shape are at the base of the plant. The whole plant may reach 2-3 feet tall with the leaves being somewhat shorter than the flower stalk. Flower stalks emerge from a clump of sword like leaves in the blue iris. Photo taken 28 April 2012. Each flower stem is smooth and round and usually gives rise to more than one flower. Flowers emerge from a tightly rolled bud. Looking down on an iris flower stalk. Notice the flower bud that will bloom tomorrow. Photo taken 28 April 2012. Each iris flower looks great for one day and then fades to let another take its place the next day. 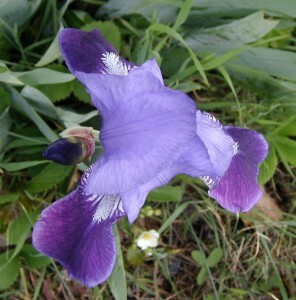 Side view of the bearded blue iris. Note the rounded flower stalk and flower buds yet to open. Photo taken 28 April 2012. 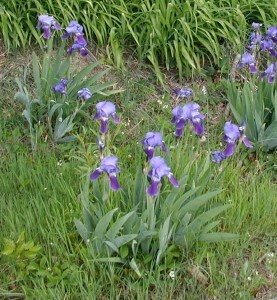 The bearded irises have a streak of fuzziness along the midline of the falling sepals. The photo above highlights the white beard on these particular flowers. The day that these pretty blue iris flowers made me stop along the road, privet shrubs were blooming and giving off their sweet smell of Spring. The flowers and trees seem to still be ahead of schedule this year. The very warm start to Spring that we experienced must have really pushed them hard. Plants that are usually May-flowering were already going strong and maybe three weeks ahead of “normal”. In the last two weeks of April the lilacs were blooming in their purple and white. Dogwood and Redbud trees had very long bloom times this year. About a week’s worth of blooms seems typical due to the usual rainy and windy spring weather that knocks down blossoms and petals, but this year so far has been a little different. 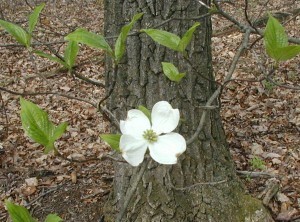 Dogwood flower with paired leaves in the background. Photo taken 15 Apr 2012. 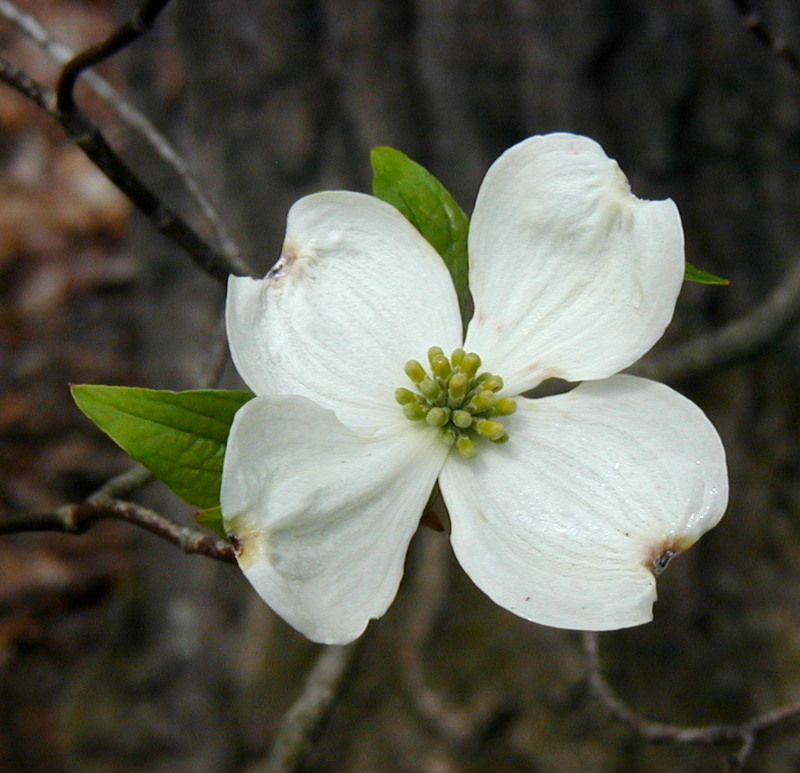 White dogwood flower closeup. Photo taken 15 Apr 2012. Small dogwood tree under oak. Photo taken 15 April 2012. Dogwood trees were exceptional this year and they bloomed for two weeks or longer. From about the 10th of April through the end of the month we saw the pretty four-petaled tree flowers all over central Pennsylvania. Flowers bloom at set times of the year according to temperature and daylight conditions. It may be practical to remember when a certain flower blooms according to what the general population is doing and not merely using the calendar. Following the calendar for “normal” bloom times this year would have resulted in us missing a lot of flowers blooming. Most plants started their spring development about three weeks earlier than normal in 2012, so thinking about relative bloom times would be more fruitful. 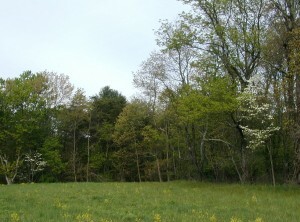 For example, two early Spring white-flowering trees may be confused when seen at a distance. (OK, if you can recognize the shapes or outlines of these trees, it’s a moot point.) The example below is about relative bloom times, not identifying spring-blooming trees in themselves. 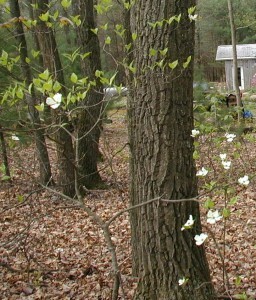 Two dogwood trees bloom among the hardwood trees developing their leaves. Photo taken 28 April 2012. 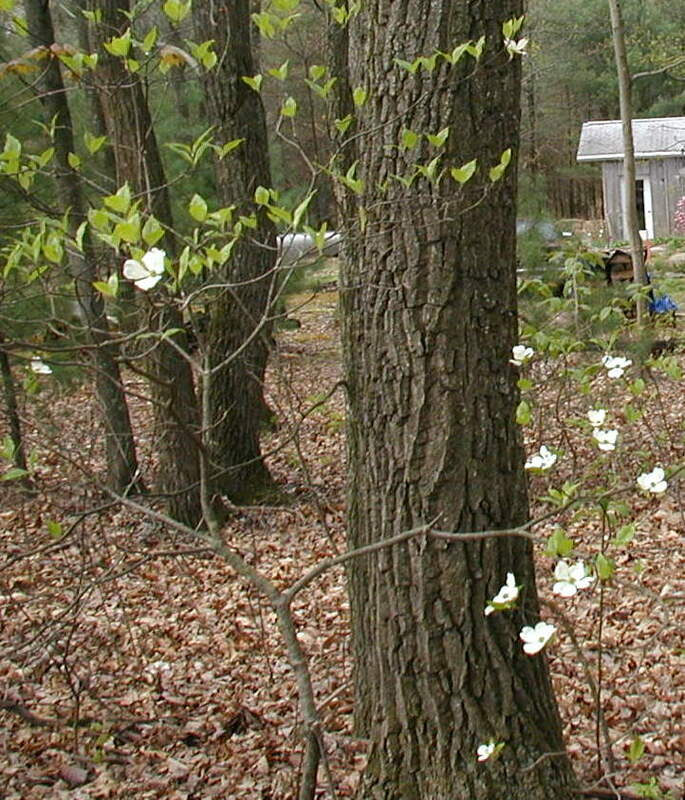 Dogwood trees blossom a little later than serviceberry trees. Serviceberries bloom when practically no leaves are on the trees. 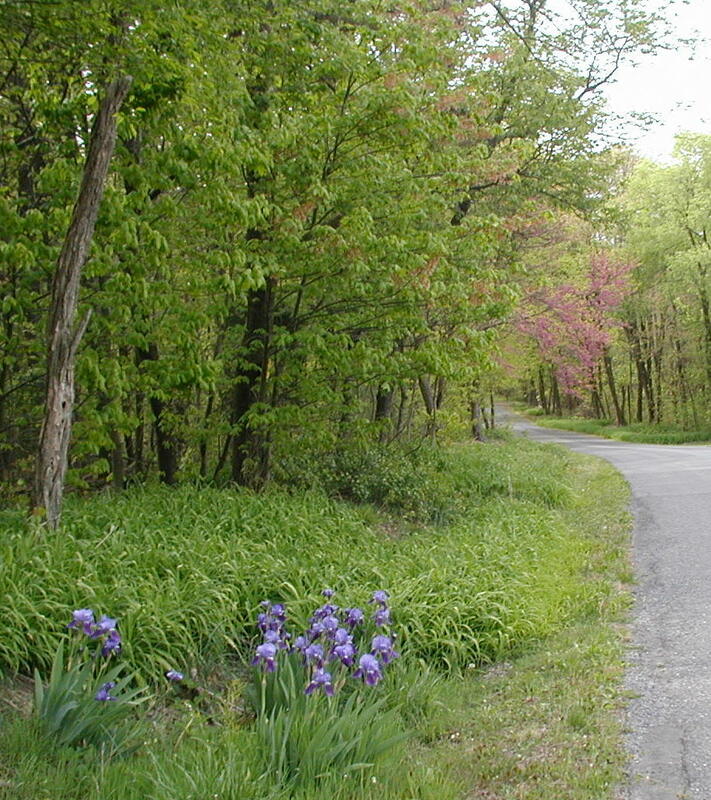 It doesn’t matter if all the trees, in general, are leafing-in early or late compared to the average bloom times. 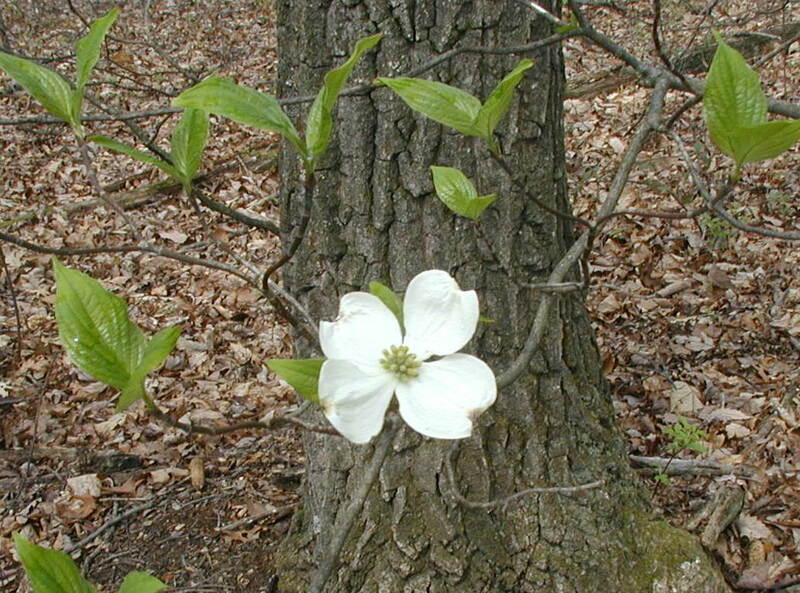 Dogwoods bloom when most of the hardwood trees have at least some leaves developed, and they may continue to bloom until the leaves are about 50% of their full-grown size. Dogwood trees flower after the serviceberry blossoms have blown away. 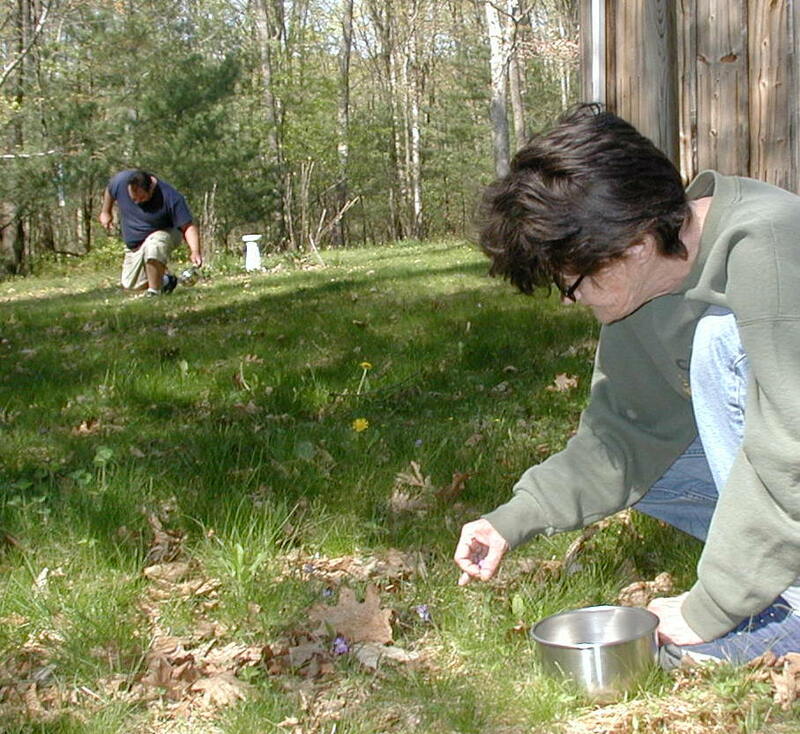 Picking up clues from the surrounding vegetation can help us learn about the flowering times of certain plants. Remember that each plant is part of a community, and it’s the relationships of all the inhabitants of the community that make it work.